The Enable block allows an external signal to control execution of a subsystem or a model. 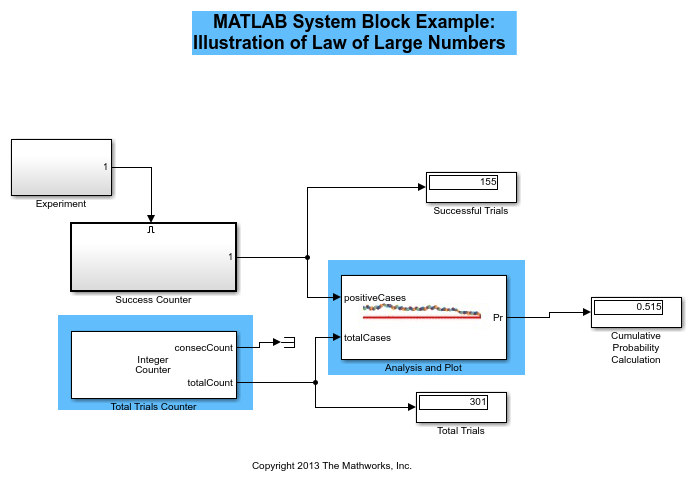 To enable this functionality, add the block to a Subsystem block or at the root level of a model that is referenced in a Model block. For multi-rate models, set the solver to single-tasking. 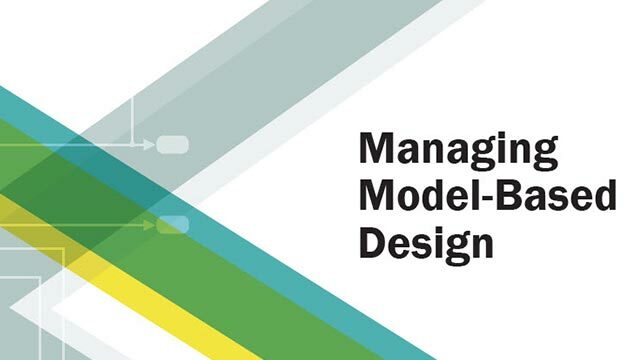 For models with a fixed-step size, at least one block in the model must run at the specified fixed-step size rate. Enable signal attached externally to the outside of an Enable Subsystem block and passed to the inside of the subsystem. An enable signal port is added to an Enable block when you select the Show output port parameter. When a Subsystem block or Model block is disabled, select what happens to block states for the blocks within the subsystem or model. Hold block states at their previous values. 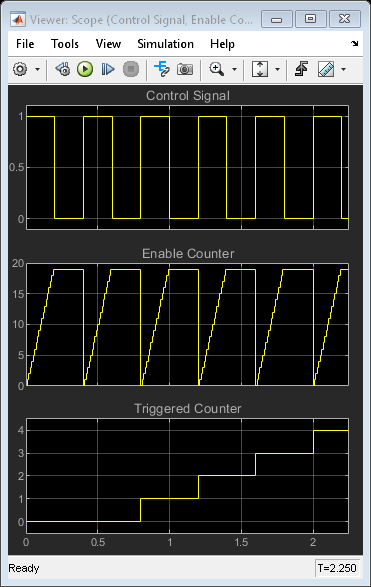 Reset block states to their initial conditions (zero if not defined). Propagate a variable-size signal when reenabling a Subsystem block or Model block containing an Enable port block. When you select this option, sample time must be periodic. The output port passes the enable signal attached externally to the outside of an Enable Subsystem block or enabled Model block to the inside. Remove the output port on the Enable port block. Display an output port on the Enable port block. Selecting this option allows the subsystem or model to process the enable signal. Control zero-crossing detection for a model. Do not detect zero crossings. Specify dimensions for the enable signal attached externally to a Model block and passed to the inside of the block. Specify time interval between block method execution. See Specify Sample Time. Sample time inherited from the model. Scalar where Ts is the time interval. Vector where Ts is the time interval and To is the initial time offset. Specify minimum value for the enable signal attached externally to a Model block and passed to the inside of the block. Simulation range checking. See Signal Ranges. Optimization of generated code. 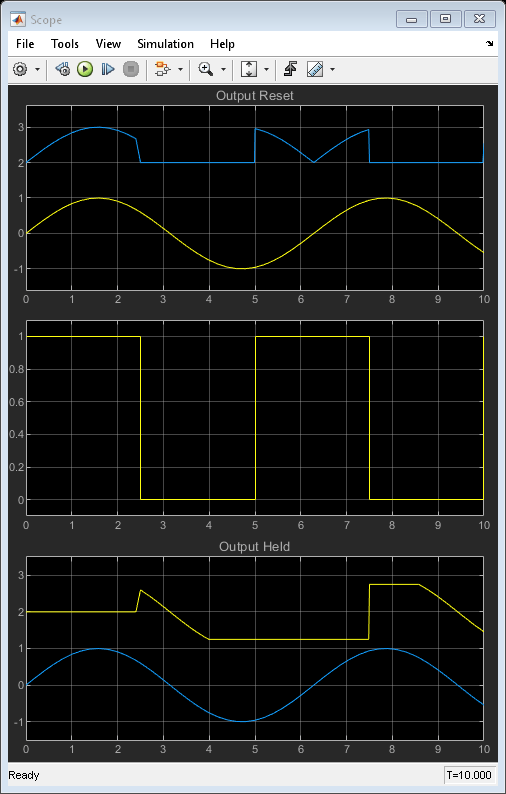 This optimization can remove algorithmic code and affect the results of some simulation modes such as SIL or external mode. See Optimize using the specified minimum and maximum values (Simulink Coder). Specify maximum value for the enable signal attached externally to a Model block and passed to the inside of the block. Specify data type for the enable signal attached externally to a Model block and passed to the inside of the block. Boolean with a value of true or false. Signed 16-bit fixed point number with binary point undefined. Signed 16-bit fixed point number with binary point set to zero. 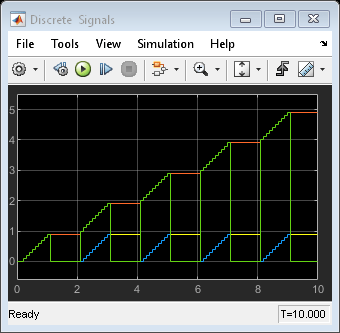 Signed 16-bit fixed point number with slope set to 2^0 and bias set to 0. Data type object, for example Simulink.NumericType. Do not specify a bus object as the expression. Select data type category and display drop-down lists to help you define the data type. Display drop-down lists for data type and Data type override. Display drop-down lists for Signedness, Scaling, and Data type override. Display text box for entering an expression. To enable this parameter, select the Show data type assistant button. Specify value of missing workspace data when loading data from the workspace. Linearly Interpolate output at time steps for which no corresponding workspace data exists. Do not interpolate output at time steps. The current output equals the output at the most recent time step for which data exists. For more information about HDL code generation, see Enable.